Problem gambling includes all gambling behavior patterns that compromise, disrupt, or damage personal, family, or vocational pursuits. 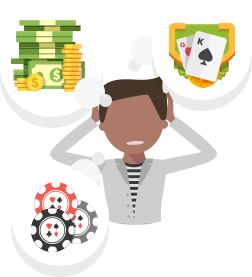 The essential features are increasing preoccupation with gambling, a need to bet more money more frequently, restlessness or irritability when attempting to stop, “chasing” losses, and loss of control manifested by continuing the gambling behavior in spite of mounting serious, negative consequences. In extreme cases, problem gambling can result in financial ruin, legal problems, loss of career and family, or even suicide. No. Problem gambling is an emotional problem that has financial consequences. If you pay all of problem gamblers’ debts, they will still be problem gamblers. The real problem is that they have an uncontrollable obsession with gambling. Aren’t problem gamblers really irresponsible or weak-willed people? No. Many people who develop problems have been viewed as responsible and strong by those who care about them. Precipitating factors can be changes in circumstances, such as retirement or job-related stress. Anyone who gambles can develop problems if they are not aware of the risks and do not gamble responsibly. When gambling behavior interferes with finances, relationships, and the workplace, a serious problem already exists. Can people be problem gamblers if they don’t gamble every day? The frequency of a person’s gambling does not determine whether a gambling problem exists. Even though problem gamblers may go on only periodic gambling binges, the emotional and financial consequences will still be evident in the gamblers’ lives, including the effects on the families. How can people be addicted to something that isn’t a substance? Although no substance is ingested, problem gamblers receive the same effect from gambling as someone else might get from taking a tranquilizer or having a drink. Gambling alters peoples’ moods, and they keep repeating the behavior attempting to achieve that same effect. But just as tolerance develops to drugs or alcohol, gamblers find that it takes more and more of the gambling experience to achieve the same emotional effect as before. This creates an increased craving for the activity, and gamblers finds they have less and less ability to resist as the craving grows in intensity and frequency. It is generally accepted that people with one addiction are more at risk to develop another. Some problem gamblers also find they have a problem with alcohol or drugs. This does not, however, mean that a person with a gambling problem is guaranteed to develop other addictions. There also appears to be evidence of family patterns of dependency as many problem gamblers report one or both parents had a drinking and or gambling problem. Approximately 85 percent of adults in the United States have gambled at least once in their lives, 60 percent in the past year. Some form of legalized gambling is available in 48 states plus the District of Columbia. The two states without legalized gambling are Hawaii and Utah. A number of states allow children under 18 to gamble, and youth also participate in illegal forms of gambling, such as gambling on the internet or betting on sports. Therefore, it is not surprising that research shows that a vast majority of kids have gambled before their 18th birthday and that children may be more likely to develop problems related to gambling than adults.